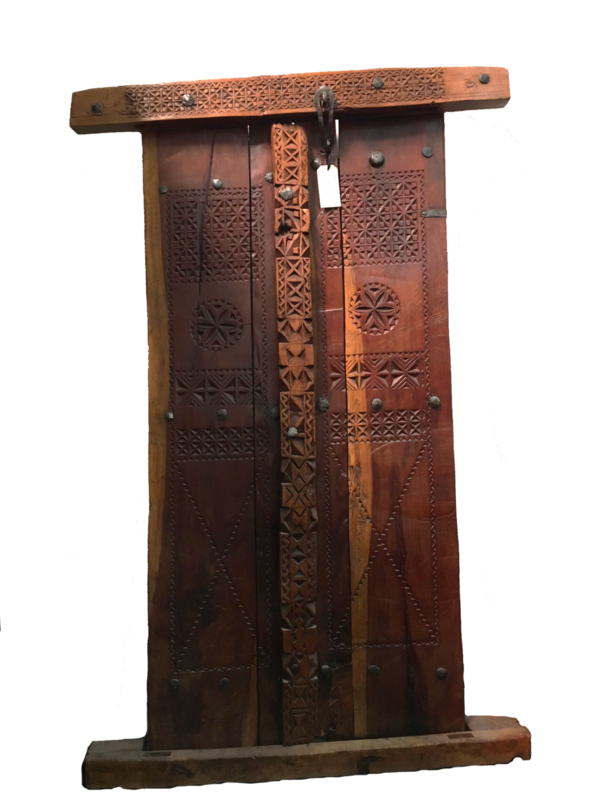 For hundreds of years doors have been one of the most important forms of decorative expression to be found in buildings of the UAE and Oman. Their beauty lies in their ability to embrace both a functional and decorative role. Traditionally local interiors were functional rather than overtly decorative. Paintings and sculptures were not generally kept and displayed for their visual appeal and decoration was reserved for utility items such as copperware, weapons, daggers, chests and doors. What makes a door a piece of art in it’s own right is carved decoration. Doors were commissioned by the head of the household and made for a specific building. The amount and quality of the carving was dependent on the price of the door and would therefore reflect the status of the household. A beautifully carved door was therefore regarded as a status symbol and a sign of hospitality. It is interesting to note that the reverse of the door or inside was never decorated, in fact it was always very crudely finished. The door carver would have worked by eye and memory so variations occur even of the same design making every door unique. There are many traditional motifs used in designs, each of which could be grouped together in an infinite number of ways to express different meanings. Due to Islamic tradition perfect symmetry was avoided and imperfections or imbalances were deliberately included in the design in the same way as practiced by the carpet weavers of the Islamic world. The basic construction has been used for the last 500 years with very few variations. 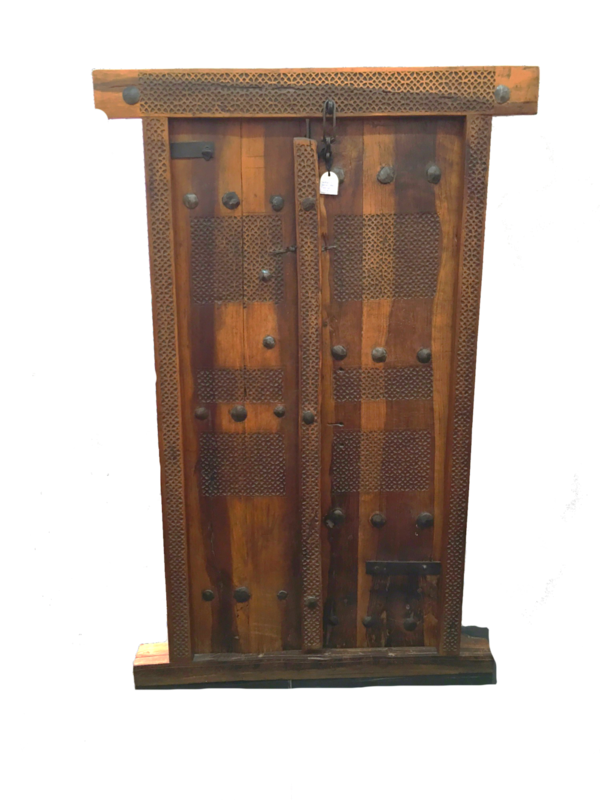 Essentially the complete door consists of two wooden door panels set behind a heavy wooden frame. The doors themselves are made from local hard wood for security and are always between two and six centimetres thick. The doors opened by pivoting on a wooden extension or pivot point at the top and bottom of the each door panel. All doors were made to open inwards, iron hinges were never used. For those people interested in obtaining a local door the supply is very limited and quickly depleting. All our doors come with a certificate of authenticity describing their style, origin and approximate age.